Catherine, Duchess of Cambridge and Prince William, Duke of Cambridge attend a reception at Government House on Day 3 of a Royal Tour of Canada on September 27, 2016 in Victoria, Canada. The reception was attended by leaders from British Columbia's legislature, government and judiciary. 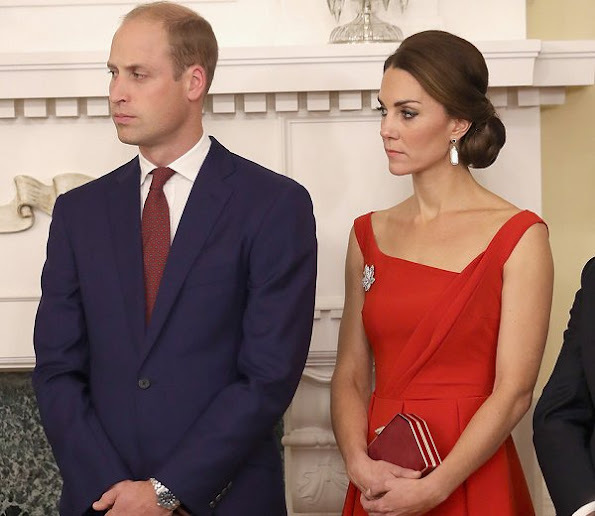 The Duchess wore Preen Dress in red for Government House reception. In my opinion this look is easily one of Kate's best to date. Effortlessly regal! That dress is absolutely WOW! Color, cutting, length, all are perfect. Up-do is nice and complements dress. What I do not like is those cheap crystal, fake pearl earrings. I think it is high time Catherine should start to have real jewels. Catherine looks beautiful, perfect dress, good hairdo , nice makeup! I love everything about this look. Stunning. One of her best looks ever! She looks beautiful ! Red really looks good on her ! Stylish, stunning, gorgeous dress and Duchess of Cambridge. She looks WOW!!! 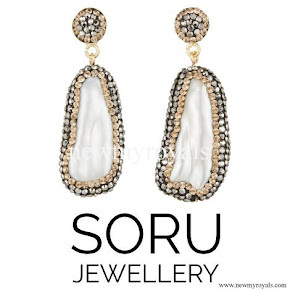 Kate wore her Baroque Pearl Double Sided Earrings by Soru Jewellery. They are described: "18ct Yellow gold vermeil on sterling silver earrings for pierced ears. Hand crafted with iridescent baroque pearls edged with multi faceted Swarovski crystals. Slight natural variances may occur between colours, shapes and sizes of the gemstone." JUST TO PROOF YOU WRONG BLONIINI!! Careful with criticism if you don't have the detail!! Excuse me Anna-Marie, what are you trying to proof? Nothing about these earrings is real. Like you explain youself, they are not real gold, only vermeil , Swarovski crystal are just glass stones and 'Baroque' pearls are NOT natural pearls. They are silver earrings coated with gold. Not real pearls, with Swarowski crystals (glass). No any real stones. Price £130 what is telling also a story about custom jewelry only. Baroque pearls are indeed real pearls. They are freshwater pearls. They are produced by black lipped oysters and gold and/or white lipped oysters. They are a variety of cultured saltwater pearls. Tahiti is the big producer of black lipped oysters. Baroque pearls are known and sought after for their irregular odd shapes. The longer they are cultured the more irregular. I have a pair that my Dad gave me long ago and they have been appraised at over $1000 USD. Bottom line they are not cheapo earrings. Thank you Diane! My point exactly. The pair of baroque earrings has a vintage, antique touch to complement the beautiful, stunning 1950s style red dress of the Duchess. The 18ct gold also indicates the quality of the setting and to creates the vintage look. When jewel people talk about real pearl it is not cultured pearls but (South) Sea pearls what oyster make themself. They are valuable. Cultured pearls are man made, when person puts stone inside shell and oysters are like catle. Of course Catherine would not need to buy those real jewels, British vaults are full of suitable jewels. Just go and borrow. About your pearls Diane, they can be real things if valued so high. Cultured pearls will never reach such value. 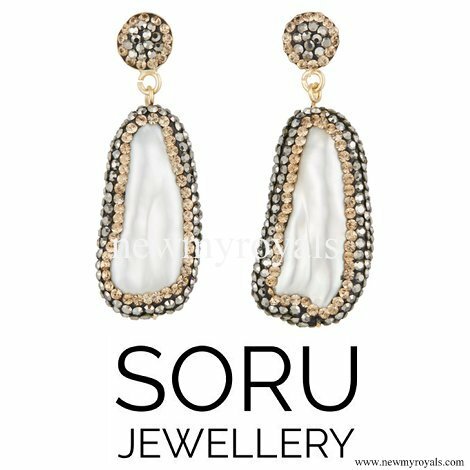 Here are some links to real South Sea pearl earrings, these are not any big name designers but you can see what I am talking about. Gemstones are my hobby, I really know what I am talking about. I was first interest in gems and that led me to royals and their jewels. Yes, there in Sout Seas are baroque pearls but they are not sold at £ 130 pair. Culturing pearls is not very old thing. It was started little more than hundreth years ago. What older pearl is the more it is posibility to be a real thing. Boom of culturing pearls is mostly counted only by only few decades now, I noticed it in 90´. I hope you wear your pearls to keep them alive and fine. I am not saying that these cheaper jewels can not look good, but my own opinion is that if situation is highly formal like that dinner, it would be polite to value other people as using fine jewels. In day time use they are fine. Looking for some pattern here, have seen bold colour many times, blue, navy, yellow, pink, white, red, im sure there are some interesting pattern can provide some surprises for us. How to avoid predictable while give us nice surprises, come on, stylist, you can do better! Am I yoo critical or just hit the point? Stunning! Total win ! Love the retro look! Magnifique !!! This looks good. It is wonderfully simple. Clear lines, no frills, no nonsense. It´s still not a dress length I like but this length is better than the half-calf length that we see so much these days and that make all the wearers look equally dowdy. Exquisite. Definitely the look of a modern, future Queen. Well done! Me encanta, de los mejores outfit!!! 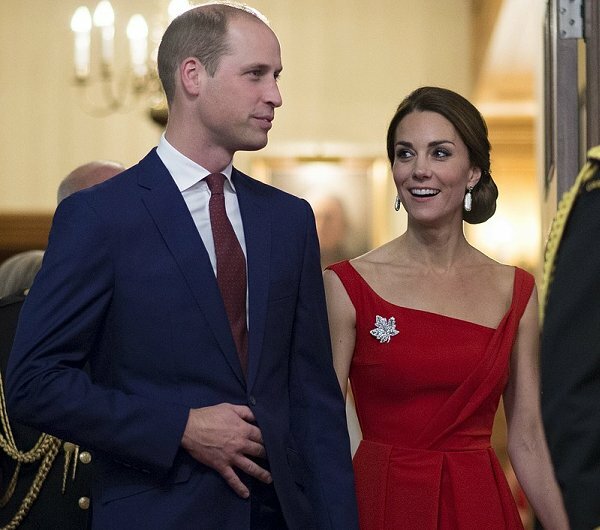 Kate se veia hermosa con ese color rojo, el broche le da un toque excelente y los aretes (aunque no es joyeria real) le daban el toque perfecto al vestido.. todo un exito! WOW, WOW, WOW Kate looks gorgeous, very classy and elegant!!! Agree that the dress is beautiful on her and more original than what she usually wears. Hair is horrible, it should be higher up to flatter her face and make sure she doesn't look 20 years older. Even a fun high ponytail would've suited this look better. Shoes should be neutral with the dress or silver or gold, not too high heels. Kate looks lovely, absolutely gorgeous. Who cares if she wears the real deal jewellery from the Royal vaults. Give the girl a break! I think Kate is a very very confident young woman who isn't bothered by adorning herself with valuable jewels just for the sake of it. You and I both know she could choose anything she fancies but didn't and instead wore these lovely earring instead. Really why worry what jewellery she wears. Those earrings looks lovely.